Disclaimer: After reading this you might never want to come over. I hope that’s not the case, but guests, you have been warned. So, when I woke up with a few itchy bumps, I think, no big deal. A few more show up, and I’m wondering about that new body wash. (At this point, I should tell you that I am also a recovering hypochondriac (well, mostly recovered).) So, perfectly in-character, my next reaction is to jump to the worst possible conclusion. We MUST have either bed bugs (the horror) or fleas (egads, no)! So, instead of waiting a few days, nixing the body wash, and continuing with my day like a normal human, what happens? Full scale eradication. Mind you, we have still not spotted a single bed bug or flea, (but methinks they are really, REALLY good at the whole undercover thing). Entire house on lockdown. Laundry hot washed and sealed. Every surface vacuumed. Dog medicated, bathed, and thoroughly combed. Google, my new best friend/worst enemy, assures me that the (still sight unseen) pestilence are busy working their way into the baseboards where they are multiplying at a rate that would make bunnies blush. Y’all. The struggle is real. And in the midst of comparing my little itchy bumps to the horrifically graphic images on the inter webs, I remember the story of Corrie Ten Boom, her sister Betsie, and the fleas. In her book, The Hiding Place, Corrie recounts their family’s role in hiding Jews during WWII and their subsequent imprisonment in a Nazi Concentration Camp. Their barracks, overrun by fleas was a constant source of aggravation, but Betsie urges Corrie to remember the instructions in 1 Thessalonians, “Rejoice always, pray constantly, give thanks in all circumstances; for this is the will of God in Christ Jesus” (5:16-18). Corrie, at first, refuses to be thankful for fleas. But later, it becomes apparent that the guards never enter their barracks because of the fleas. This allows the sisters unprecedented freedom in holding church services and sharing the gospel with over 400 other inmates. So as we begin this month of thankfulness, the girls and I spent our morning meeting by reading the excerpt from The Hiding Place. I urged the girls to think of the fleas in their own lives: Where have you faced frustration or pain; where did you struggle? How did God use that in the end? In my life, real or simply perceived, I must thank God for the fleas, for they draw me closer to Him. 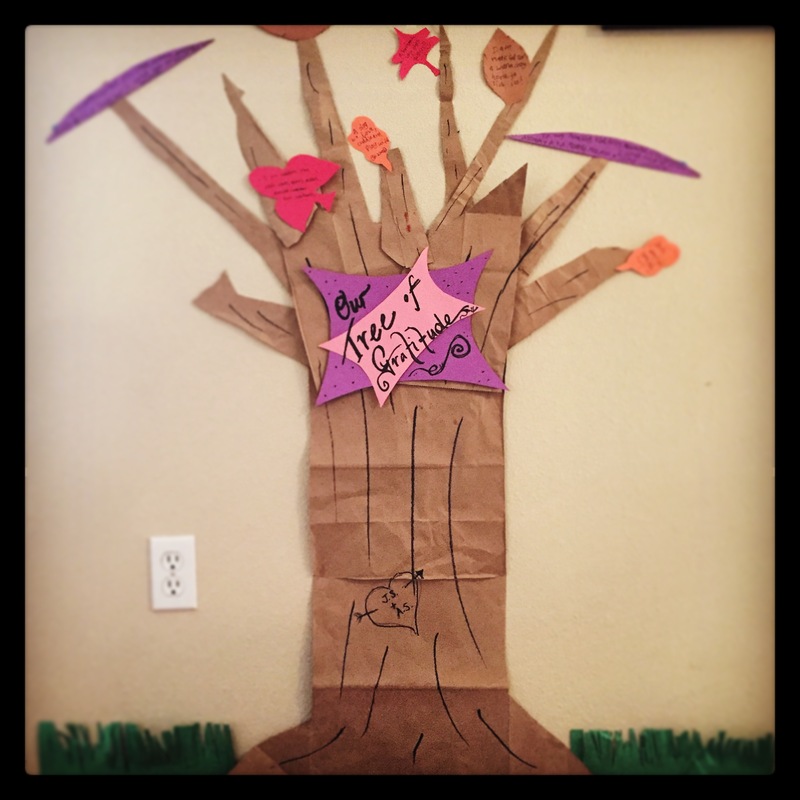 And as we created our Tree of Gratitude, the leaf containing one word, FLEAS, was placed at the top.